The notion of an intinerant bluesman, guitar slung across his back as he travels dusty roads and plays for his supper, is quaintly out-of-date. 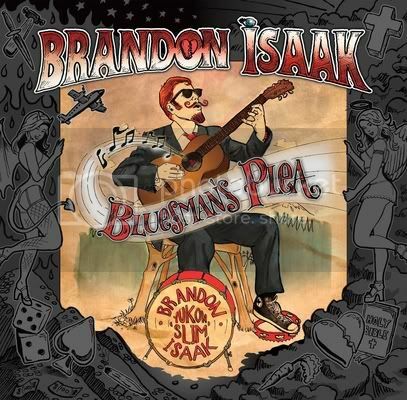 Yet Bluesman’s Plea, the first solo outing from Brandon Isaak, frequently conjures just such an image. Isaak, usually found fronting Vancouver-based jump-blues band The Twisters, is largely on his own with Bluesman’s Plea, and instrumentation is primarily acoustic. There’s nothing quaint or dated about Isaak’s music, though. An all-original collection (eleven songs, with three ‘bonus’ cuts), there are enough ‘modern’ touches, courtesy of producer, engineer, drummer (oh, and younger brother, too) Chris Isaak, to keep this from a stroll down memory lane. Chris’ production is most evident on three tracks that feature ‘found sound.’ Hard Workin’ Woman begins with a voice-over recording of airplane boarding instructions, and quickly becomes a lament for the titular hard-working woman whose business travels keep her away from home more than Isaak would like. Take My Message includes a brief snippet of an old-time, fire-and-brimstone sermon, while A Little Wine includes with muffled news reports and moody background effects that lend the tune an eery, vaguely claustrophobic air – it’s unsettling and arguably a bit out of place on the set list, but as a cautionary tale – how quickly ‘a little wine’ becomes too much wine – it works just fine. For the most part, though, the feel is fairly sunny. Chris Isaak’s drums are unobtrusive in the extreme, adding a minimal bit of rhythmic drive while never drawing attention away from Brandon’s fleet and agile picking. And the elder Isaak proves a fine singer indeed, with just a hint of a growl on occasion that adds a welcome touch of grit. He also adds harmonica to a track, though it’s pretty rudimentary and primarily for effect. Above all, Isaak comes accross as relaxed and thoroughly comfortable – these are, after all, his songs, and he inhabits them as though they’re simply a part of his DNA. His delivery is effortlessly honest and candidly intimate, the easy-going sound of an old friend singing songs simply because they satisfy his own soul.